The Huh? 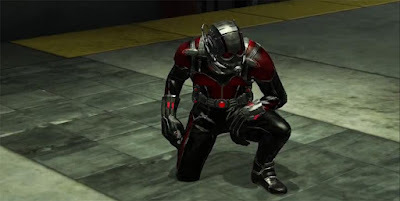 : Ant-Man: Ant Invasion of Marvel Heroes 2015! Ant-Man will reach theaters this Friday, and he's already made appearances in other games, such as the mobile Marvel's Future Fight, but he is set to release this week in the massive Marvel free-to-play game Marvel Heroes 2015. For people that don't know what this game is, think of Diablo, but with almost 50 starting characters- ALL of which are amazing Marvel properties. From the X-Men and Avengers all the way to the Guardians of the Galaxy. This game is a must play for anyone with a computer. Anyways, this week developer Gazillion is deploying both a movie-version and comic version of Scott Lang as Ant-Man, as well as an separately voiced Hank Pym Ant-Man. Game Informer has all the information on the release (see link below), a nice exclusive trailer including an Anchorman reference (of which I made a Meme about over a month ago), and some info graphics of how improved the game has become since it launched in 2013. It might also be of note that Gazillion is running a Charlie and the Chocolate Factory-esque contest involving 5 Vibranium Tickets that anyone can win- netting them $5000. Anyone can win, regardless of how long they've played. So now is the perfect time to join the game.